The memo goes on to point out that Harvard’s costs for these publishers now approaches $3.75 million. Iowa’s costs for the three largest publishers (presumably the same group, though precisely which are included in the Harvard figure is not clear) is expected to be around $3.2 million in FY2012. While the figure quoted is said to be around 10% of Harvard’s total acquisitions budget, $3.2 million is over 20% of Iowa’s total. The memo concludes with a strong statement and list of suggested actions, worth quoting at length. Note that DASH is equivalent to our own Iowa Research Online, though unlike Harvard, Iowa does not have an open-access policy (aka “mandate”). It is untenable for contracts with at least two major providers to continue on the basis identical with past agreements. Costs are now prohibitive. 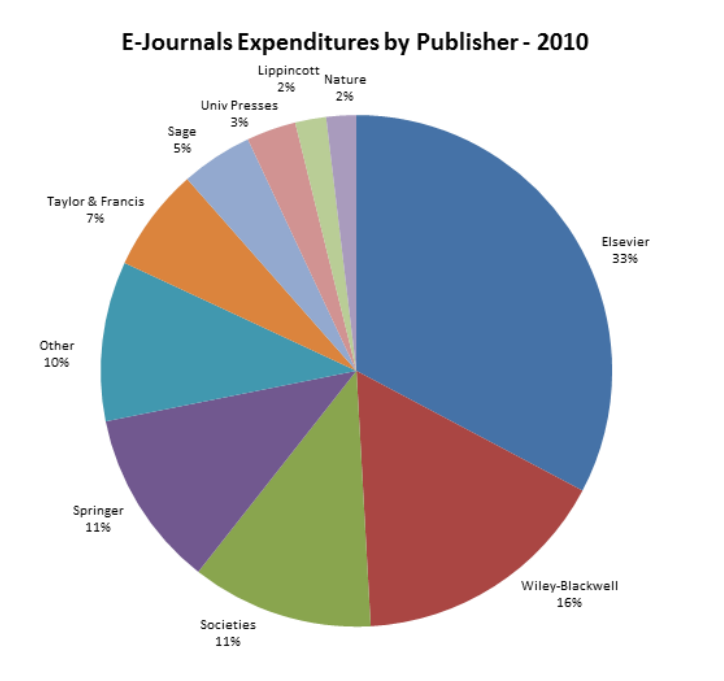 Moreover, some providers bundle many journals as one subscription, with major, high-use journals bundled in with journals consulted far less frequently. Since the Library now must change its subscriptions and since faculty and graduate students are chief users, please consider the following options open to faculty and students (F) and the Library (L), state other options you think viable…. “One option reportedly under consideration is to withhold the last installment of a grant until the research is publicly available; another option would be to make grant renewal contingent on open access publication. A boycott aimed at the publisher Elsevier, initiated by Timothy Gowers, a prominent mathematician from the University of Cambridge, has picked up support in recent days, attracting as of Jan. 31 at 4 pm CST over 2350 signatures. One of the motivations for his call for a boycott was Elsevier’s support for the Research Works Act (RWA–see our blog post of January 11th). “Timothy Gowers of the University of Cambridge, who won the Fields Medal for his research, has organized a boycott of Elsevier because, he says, its pricing and policies restrict access to work that should be much more easily available. . . The company has sinned in three areas, according to the boycotters: It charges too much for its journals; it bundles subscriptions to lesser journals together with valuable ones, forcing libraries to spend money to buy things they don’t want in order to get a few things they do want; and, most recently, it has supported a proposed federal law (called the Research Works Act) that would prevent agencies like the National Institutes of Health from making all articles written by its grant recipients freely available.